Coll. No. 1087, 25 Apr 2015, characters observed: Low growing perennial, from a woody caudex, to 2.5 cm. ; Leaves, linear, 30 mm. × 1.2 mm. wide, appressed hairy, eglandular; Peduncle, 3 mm., spreading hairy, eglandular; Heads, solitary, disc 15-20 mm. wide; Phyllaries in 3+ overlapping series, 8 mm. × 1.2 mm. wide, all same length but inner phyllaries attached higher on receptacle giving impression of inner > outer, green, margin scarious and ciliate, tips acute and ciliate but not obviously tangled; Receptacle epaleate, flat; Ray flowers, fertile (pistillate), cypsela 3.3 mm., tuft of glandular hairs at base, pappus of 1 series white bristles, 4 mm., corolla, 11 mm., lavender; Disc flowers, bisexual, cypsela, 3.7 mm., glandular hairy, pappus 1 series white bristles, 4 mm., corolla, 3.8 mm., yellow, lobes dark. Field Notes: Coll. No. 1087, 25 Apr 2015. 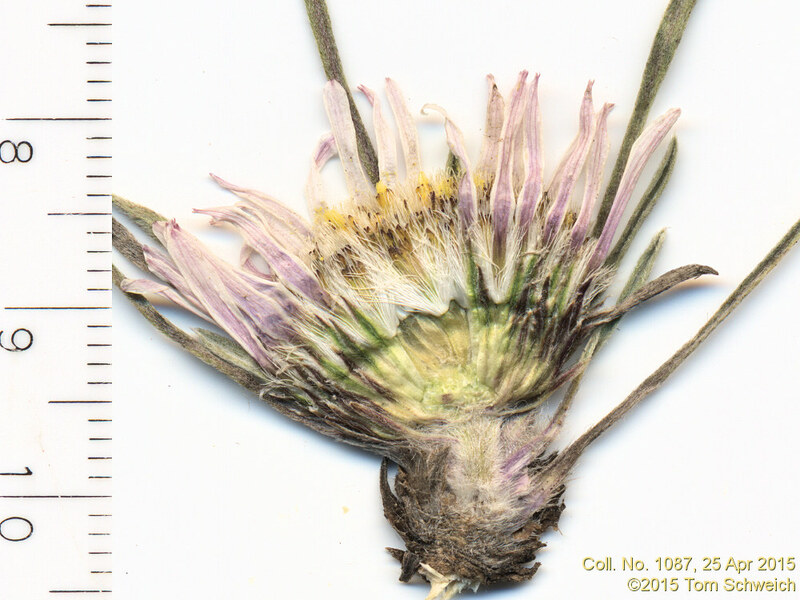 Other photos about Species - Asteraceae or Townsendia hookeri.